1. Letha Luthia James: born April 20, 1886 in Mississippi; married Samuel Lee Russell (1877-1940); died June 18, 1953 (aged 67) in Colbert County, Alabama; buried at Russell Cemetery in Maud, Colbert County, Alabama; known children include: Bluford Lee Russell, Finous E. Russell, Marion Albert Russell, Letha Alta Russell and Vera Almedia Russell. 2. Cynthia Jane James: born April 9, 1888; married Elmer Cordova Turbyfill (1875-1951); died January 11, 1938 (aged 49); buried at Trenton Cemetery in Trenton, Phillips County, Arkansas. 3. Mollie Naomia James: born December 3, 1889; married Rufus Franklin Goza (1889–1978); died February 3, 1963 (aged 73); buried at Lindsey Cemetery in Dennis, Tishomingo County, Mississippi; known children include: Eunice T. Goza, Virginia "Jessie" Goza, Susie Goza, James R. Goza, Henry Ivan Goza and Joy A. Goza. 4. Nancy “Nannie” Etta James: born 1891; married Claude Esco Foote (1892–1959); died 1982; buried at Cypert Cemetery in Cypert, Phillips County, Arkansas. 6. William Austin James: born February 12, 1895; married Eva Lena Parrish (1894–1984), daughter of Thomas Webster Parrish and Maggie Patterson; died February 24, 1963 (aged 68); buried at Hillcrest Memorial Gardens, James Plot in Red Bay, Franklin County, Alabama. 7. Clarence Burton James: born October 21, 1896 in Franklin County, Alabama; married Maude Arvazeeny Reneau “Reno” (1904–1998), daughter of Lafayette Reneau and Gannie Walker; died August 4, 1955 (aged 58); buried at James Cemetery in Pogo, Franklin County, Alabama; known children include: Dewdrop Rachel James, Robert Doyle James, Truett Clarence James and Betty Jo James. 8. Ada Susan James: born 1898; married William Harvey Parrish (1896-1996); died 1972. 9. Ida Modena “Dena” James: born 1901; married Milas Lee Taylor (1895–1991); died 1971; buried at Allen Line Cemetery in Prentiss County, Mississippi; known children include: Odas Lee Taylor, Otha Vernon Taylor and Bela Hayden Taylor. 10. Henry Thomas James: born July 28, 1903; died July 1976 in Poplar Grove, Phillips County, Arkansas; buried at Sunset Memorial Park in Walnut Corner, Phillips County, Arkansas. 11. Artis Lee “Artie” James: born April 14, 1907; married Wilma O. McCaig; died January 7, 1981 (aged 73); buried at Marvell Eventide Cemetery in Phillips County, Arkansas. William Amos James (1860-1883) was the son of Elias Walter James (1836-1917) of Franklin County, Alabama and Cynthia McGary Richardson (1847-1915). Family Records of Toni Lynn James of Phillips, Arkansas, granddaughter of Clarence Burton James (1896-1955). Find A Grave Memorial for Letha Luthia James Russell (1886-1953), Memorial ID No. 13475285, created by Preston Malone, added February 27, 2006. Find A Grave Memorial for Cynthia J. Turbyfill (1888-1938), Memorial ID No. 29354952, created by Bea Smith Daniel, added August 27, 2008. Find A Grave Memorial for Mollie Naomia James Goza (1889-1963), Memorial ID No. 13484186, created by Preston Malone, added February 28, 2006. Find A Grave Memorial for Nannie James Foote (1891-1982), Memorial ID No. 100214831, created by Merf, added November 5, 2012. Find A Grave Memorial for William Austin James (1895-1963), Memorial ID No. 43893557, created by Preston Malone, added November 3, 2009. Find A Grave Memorial of Clarence Burton James (1896-1955), Memorial ID No. 46227366, created by Jean Bower, added January 1, 2010. Find A Grave Memorial for Modena “Dena” James Taylor (1901-1971), Memorial ID No. 31537318, created by Jean Bower, added November 18, 2008. 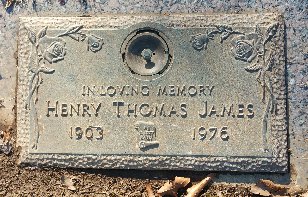 Find A Grave Memorial for Henry Thomas James (1903-1976), Memorial ID No. 138471715, created by The Last Ride, added November 8, 2014. 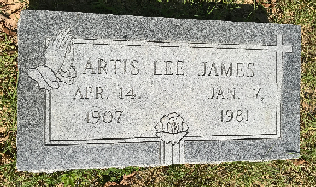 Find A Grave Memorial for Artis Lee “Artie” James (1907-1981), Memorial ID No. 191384892, created by Ruth Bass-Burgess, added July 14, 2018. 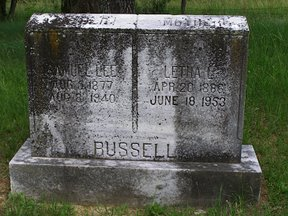 Below - Tombstone of Letha Luthia James (1886-1953) and Samuel Lee Russell (1877–1940). 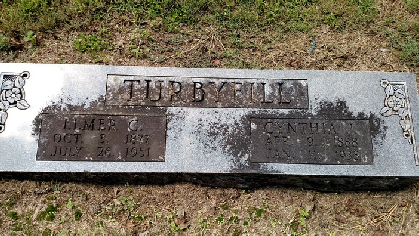 Below - Tombstone of Cynthia Jane James (1888-1938) and Elmer Cordova Turbyfill (1875-1951). Below - Tombstone of Nancy “Nannie” Etta James (1981-1982) and Claude Esco Foote (1892–1959). 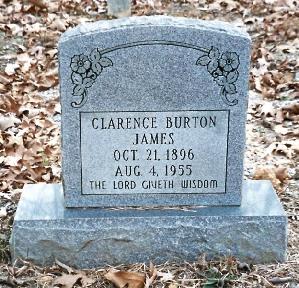 Below - Tombstone of Clarence Burton James (1896-1955). Below - Tombstone of Ida Modena James (1901-1971) and Milas Lee Taylor (1895–1991). 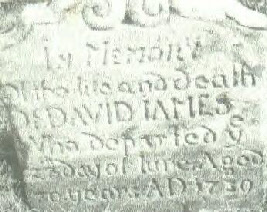 Below - Tombstone of Henry Thomas James (1903-1976). Below - Tombstone of Artis Lee James (1907-1981).